"To get beyond sights listed in most guidebooks, call Tom & Marie Zahn from P.A.T.H. FINDERS Intl.. Tom is an American who married into the Czech Republic (Marie), and together they organize and lead family-friendly, day excursions (both in Prague or throughout the country). Their tours are creative, affordable, and help travellers learn to find off-the-beaten-track destinations (even by themselves). Tom and Marie also have associates in other countries thoughout the region (notably, Germany, Hungary, Poland, Romania, Slovakia, and Ukraine) and can help you with any part of your Eastern European travel. Their specialty is Family History Research & Travel (Personal Ancestral Tours & History), and given sufficient notice in advance of your travel, they can help you find ancestral homes, and perhaps even a long lost relative." I was able to successfully open and print your report. It did not verify all the stories I had been told, but I would rather have the truth than believe something that is not true. (I know, that makes me very unusual for an American since most Americans would rather live in their own illusions than deal with the truth ) The research was very thorough and I really appreciate that! We may not have family to come visit when we come to CZ in 2007, but perhaps I will be able to thank you and Tom personally. I hope you have had time to rest and relax wiith your family after your busy summer and autumn. The Smutny group is having much fun sharing photos of our great adventure. The trip was a great success, thanks to both of you and your very talented guides. You were so wonderful in dealing with the small crisis with Mr. Al Smutny. We will never forget driving the bus and the trailer through the construction zone at the hospital. We hope that you, the driver or Pavel did not receive a fine from the authorities. The guard at the hospital looked very unhappy at us. Our family has the highest praise for you, Ondrej and Pavel and our drivers Rudy and Honza.. Altogether Pavel and Ondrej helped us find 6 family homes. It could not have been done without the good work of your geneologist, Mr. Petr Prochazka, so our grateful thanks to him also. Just how interested are people in their ancestors? Well, to tell the truth there's not much interest among Czechs. But Americans of Czech origin, now that's a different story. 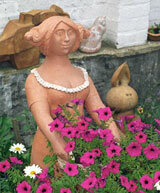 There are numerous organisations helping people find their roots in the old country. One of them is called Path Finders, and its founder, Thomas Zahn, is an American who besides his Irish roots also has Austro-Hungarian great-grandparents. He came to the Czech Republic a couple of years ago to look into his family's past. He married a Czech girl, and stayed on to help other Americans looking for their Czech and Slovak ancestors. During our visit you asked what was the high point of our visit to the Czech Republic. Our visit to Chvalenice was really the most memorable part of our visit and the experience of a lifetime. Thank you and the lady who opened up the church for us for making our visit so unforgettable. We will certainly tell all our family and friends about your hospitality and kindness. The Zahns planned our trip of a lifetime to four places in the Czech Republic in September 2005 -- a 17 day trip. Our accommodations were excellent, but not expensive. (The $ goes far in the Czech Republic... While we never eat out here in Colorado, we enjoyed the cafes every day in the CR...) We spent ample time in four different regional genealogical archives, three of them in the company of researchers in the Pathways network. Marty's Mom is a native speaker of the Czech language, so she could see for herself what an expert job these researchers do in reading the old records. We are very pleased with the complete research reports Pathways produces, and are happy to recommend them as a reliable genealogical research service. The highlight of our trip was the day our Pathways driver took us to the rural village in Moravia where our Czech grandma was born. There was her old home, the old well, and most likely, the old school yard across the street! Except for this day of exploration, and a similar day in another province, we found the public transportation was inexpensive, very comfortable and efficient, taking us wherever we wanted to go. Before your trip, of course, you will want to read one of the guidebooks, so you'll be ready to appreciate all there is to see and do in the CR. If you enjoy languages, you might enjoy the Pimsleur tapes, which will teach you enough to pronounce any word in Czech, and ask basic questions. In Prague, of course, many people speak English. We learned about Pathways on the internet. They do a fine job of making reservations and other travel arrangements, and provide excellent genealogical research services. We wholeheartedly recommend them! Genealogy has taken me many places, both real and virtual. My maternal grandparents were first generation immigrants to the US. This led me to research on Europe. My scandinavian research was easily done in the US through the family history libraries of the Mormon Churches in my area. 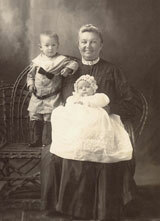 Later, I had help with my swedish research by email with Gary T. Horlacher, an accredited genealogist. I then traveled to Norway and Sweden in Scandinavia to understand the lives my grandparents led and left. My paternal grandmother was the first generation born in the US from Bohemia, later Czechoslovakia. The Czech Republic has not yet allowed anyone to microfilm their records and I recruited, Tom Zahn of Pathfinders to research my family from the Czech Republic. I can highly recommend their services. 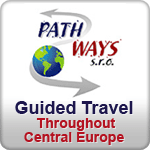 Their web site www.pathfinders.cz describes their services in more detail. Later he hosted me when I visited Prague. He took me on a travel adventure back in time in that land of castles and classical music. He had even looked up some very distant cousins who shared some wonderful food and of course their local brew with me. Tom Zahn drove all the way here from Olympia to share his expertise with us. Where do I start with his sharings! First, He and his wife Marie attended the grand opening of the Prague Archives. The study rooms are open, but they still have much work to do in other parts of the building. He brought a catalog from the historical collection to share. Tom is putting together a slide of unknown treasures (towns, castles, etc.) to visit when in the Czech Republic for the CGSI Conference in Prague 2005. 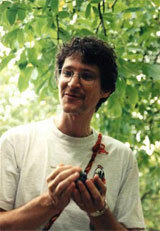 He will show these slides at the 2003 CGSI Conference in Houston, Texas. He has been working on a project to start getting the 6,000 Bohemian and Moravian Kadastral maps digitalized so the CGSI can have a copy! I thought his commments about who inherits the family farm in the old country were very interesting. My gr-gr-granddad was the oldest and didn't get the farm so he came to the USA in 1880. It was the youngest who got the farm. Tom said that started in the 1850's. Comments about Maria Theresa's influence on the serfs' lives gave broader understanding to midwives. They had to be educated,plus taught NOT to made the serfs' families smaller. Families became larger with her influence. The Czech and Slovak phone books online are good, but most people over there have mobile phones, so we need to find a directory for those. 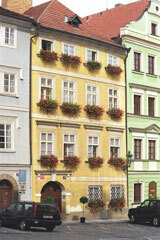 You can email Tom Zahn if you are interested in his Pathfinders business in Prague. THREE CHEERS FOR TOM HELPING CHERI SMITH. She showed Tom the birth certificate from church records here in the USA and Tom recognized the area! Cheri has been looking at that for years, it seems, and with Tom's help now can do further research. Why: Thomas Zahn was recommended in the section on the Czech Republic. We booked a day trip to the Bohemia region (Krivoklat) with him and it was fabulous. Tom is extremely knowledgeable about the history of the Czech Republic. We wanted to get out of Prague and hike in the countryside. On our trip with Tom, we visited a castle, had wonderful prepared lunches, which Tom provided, in the castle courtyard, and spent a leisurely day hiking in the countryside. We capped the day off with a beer at a local Czech hangout. Our day trip with Tom was our BEST experience in Prague. We highly recommend his services because Prague can be a burnout (too many tourists), and it is a great way to get out and see the countryside, and learn about the history of the country. This is castle country. Apart from the 300 or so that are up for sale (appointments with estate agents can easily be arranged during your trip), there are plenty to visit, most of which are desperately in need of your cash to overhaul the plumbing and upholster the furniture. Tom Zahn of Pathfinders organises weekend "getaway" tours taking in some of the best. If you spend a long weekend cycling, hiking and canoeing (three nights, £138) in the Sumava region, you get to stay at the Hotel Atava in Rabi, which claims to be "the largest castle ruin in Bohemia". Other weekends include horseriding, concerts, visiting a medieval festival, and celebrating the wine harvest in Valtice. Pathfinders provides guides and transport and will also organise balloon rides, bungee jumping or shooting.